NEW CITY. NEW RULES. NEW MONSTERS. SAME FIGHT... TO BE THE KING! There’s always something happening in the city that never sleeps. Maybe it’s the lights, maybe it’s the energy, or maybe it’s the giant monsters trying to demolish the place! Get ready for Richard Garfield’s follow up to the best-selling King of Tokyo! Who will be the King of New York? 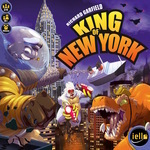 King of New York introduces lots of new ways to play, while still keeping the core ideas of King of Tokyo. There are Buildings to Stomp! Vengeful Military Units to Destroy! Six brand new Monsters! Every roll of the dice might mean that your monster feels the OUCH, as military units open fire. Will you grab the spotlight, and become a celebrity Superstar? Or will you become the defender of the city, and befriend Lady Liberty? Each of New York’s boroughs has its own charms, but to truly rule the Big Apple, you have to control Manhattan. Defeat the other monsters and rule the city.... Become the King of New York! After playing King of Tokyo, King of New York seemed the next logical choice as a purchase. I did not want to buy KoT as my brother had it and doubling up on games we can share seemed silly. This game is a step up from KoT, it has all the KoT feeling and more. I had the whole family playing it within minutes. Within 2 games the 7 year old had it nailed, the 10 year old had it from the off. Is it a kids game... No.... and Yes... I mean NO! KoNY it's KoT on steroids. more options, more game, more fun. It's KoT's big brother - Buy It. Even if you own KoT, get this too. It's a filler that fills an evening completely.